High fashion design meets imaginative and spontaneous style with the Vue Stella 3-Piece Reversible Quilt Set. 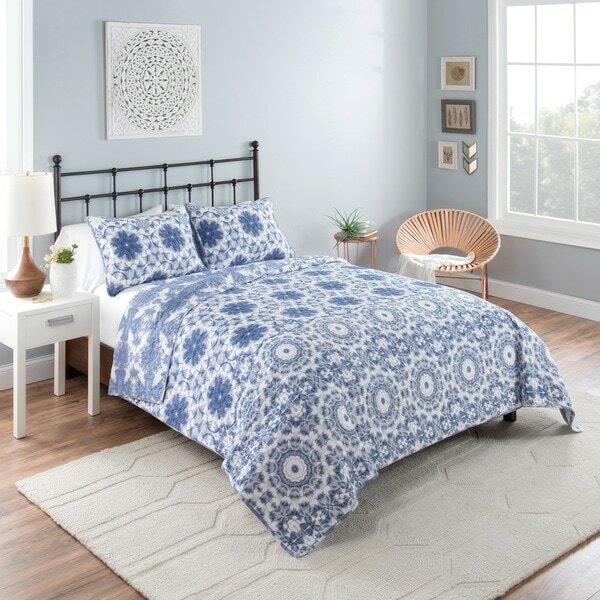 This trendy quilt features kaleidoscopic medallions in varying themes. Reverse features kaleidoscope pattern with a tie-dye aesthetic. Quilt is oversized and colors are bright. It's a little thin but that works for me. I like the shams' plain design. The quilt is fine but the print just didn't look as nice in person. We returned these and purchased different ones. It however is 100% cotton filled, is soft (not very easy to find these days) and is at a good price for that. If you don't mind slightly dull-ish colors you might like this. This is the first time I've purchased this brand but I won't be afraid to buy it again. The quilt is very good quality and the colors are vibrant. It's a great medium weight blanket that will work well on all but the coldest of nights. I kept this and I like it but it does not look like the image.